Debby Rosenberg has been a Personal Trainer for eight years. She is certified with the National Academy of Sports Medicine in Personal Training and Senior Fitness. She works with a diverse clientele on goals such as weight loss, corrective exercise, strength training, flexibility and posture. She specializes in senior fitness and bone health. In addition, Debby has worked with clients for post-rehabilitation after surgery. 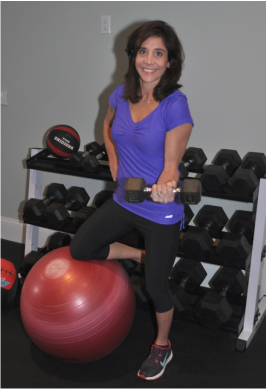 Debby began her career as a Personal Trainer at the Saw Mill Club in Mt. Kisco before starting her own fitness business. Currently, she trains clients in the comfort of their own homes or in her home in Westchester County, NY. Debby likes to get to know her clients after an initial fitness assessment, in order to develop a personalized plan to achieve their goals. Debby also believes it is important to explain the reasoning behind exercises and movement patterns. The better educated the client the better they will understand what is involved in their progress. This understanding gives them control and motivation to do their personal best. Having her clients reach their personal best is what Debby finds the most rewarding about being a Personal Trainer.